For income investors, the recent uptick in short-term interest rates served as a reminder that their bond portfolios remain vulnerable to risk. Rising interest rates tend to erode the value of a bond portfolio, leaving investors vulnerable to declines in portion of their portfolio which is supposed to be relatively safe. Even after two interest rate hikes by the Bank of Canada earlier this year, rates are still historically low and don’t offer adequate yields. It may be prudent for investors to adopt a diversified approach to income investing. Equity-derived income can provide attractive yields in this yield starved environment, along with the potential for capital growth. However, one must be cognizant of not over reaching for this yield. Investors that may be turning to equities to satisfy their income needs must bear in mind that not all dividend strategies are created equal. A dividend strategy that focuses on quality and downside protection with a high-conviction focus on dividend growth can help investors reach their income goals while providing the potential for capital growth. Dividends can signal a number of attributes about a company, such as financial health, management’s confidence in earnings, or future growth prospects. Companies that do not pay dividends aren’t necessarily bad investments, but historically, dividend-paying companies have outperformed non-payers. In particular, companies that have consistently grown their dividends have outperformed those that pay non-increasing dividends as well as those that don’t pay dividends at all. These companies tend to be mature enough in the business life cycle to be able to pay dividends and still retain sufficient free cash to fund continued business growth. As a result, these dividend growers have exhibited lower volatility than non-dividend payers. Source: RBC Capital Markets Quantitative Research. Note: Data is calculated on an equal-weight basis using the S&P/TSX Composite Total Return Index between October 1986 and July 2015. Risk is measured using standard deviation. Standard deviation measures spread or variability around the average. The larger the number, the greater the historical volatility, and the higher the potential risk. 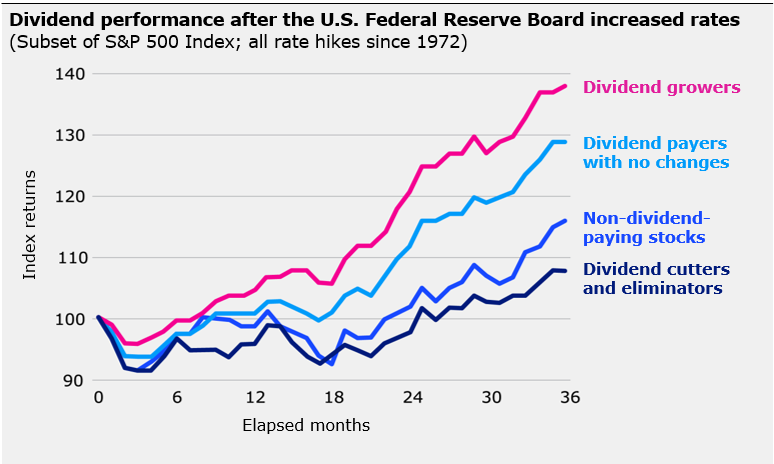 Furthermore, dividend growers have historically flourished in periods of rising rates, outperforming payers with no change, non-payers and cutters. Source: Ned Davis Research, Inc. Further distribution prohibited without prior permission. Copyright 2015 @ Ned Davis Research, Inc. All rights reserved. Past performance is no guarantee of future results. Data shown is based on the average performance after all rate hikes since 1972, which occurred on the following dates: Jan. 15, 1973; Sept. 30, 1980; Apr. 9, 1984; Sept. 4, 1987; Feb. 4, 1994; June 30, 1999; and June 30, 2004. The returns do not reflect the deduction of any fees, expenses or taxes. Returns for stocks that paid dividends assume reinvestment of all income. Investors cannot invest in an index. All data is expressed in U.S. dollars. A dividend strategy that screens for dividend growers may lead to a portfolio of companies that tend to be high quality, with strong fundamentals and a management team with conviction. While equities can offer attractive yields, investors should be wary of falling into a yield trap. This refers to a scenario where a company is struggling and its share value has eroded. The indicated yield appears high because it is based on past dividends, but it may only be a matter of time before the dividend is reduced or eliminated altogether. You can read more about yield traps in this blog post by my colleague Thomas Boccellari. Dividend strategies that weight securities by yield alone may be susceptible to yield traps. To avoid this, investors should look for a strategy that focuses on consistent, growing dividends that can help avoid these yield traps and cushion against periodic downturns in the value of the underlying stocks. This approach is taken by the NASDAQ Select Canadian Dividend Index, which is the underlying index of PowerShares Canadian Dividend Index ETF (PDC). 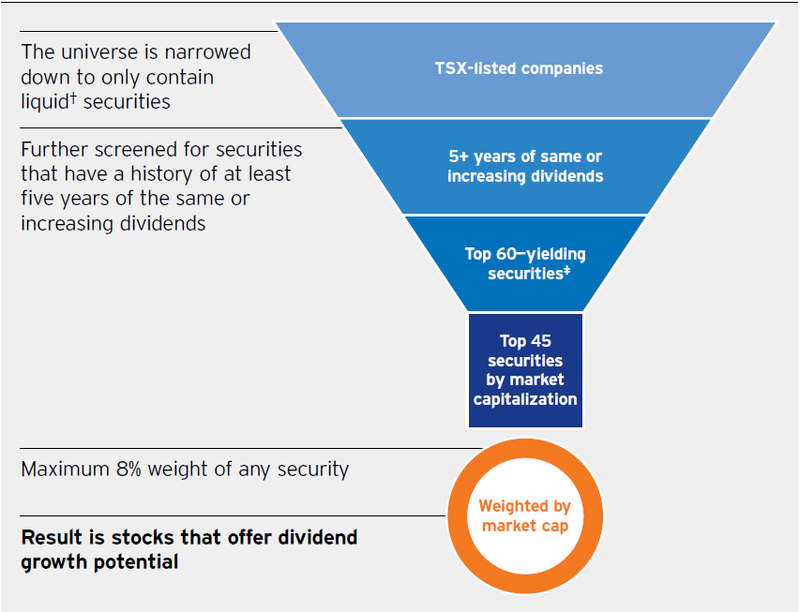 This index is made up of Canadian stocks that have stable or growing dividends for at least five consecutive years. The top 60 yielding securities are reduced to the top 45 by market capitalization.‡ This helps to avoid exposure to smaller companies that may introduce unwanted volatility into an income portfolio. They are then weighted by market capitalization to a maximum of an 8% weight of any security helping to reduce single security risk. For illustrative purposes only. Source: Invesco Canada. †The security must have a minimum three-month average daily dollar trading volume of CAD $1 million. ‡Only one security per issuer is permitted. For more information on the index methodology, please visit powershares.ca/PDC. For investors concerned with rising interest rates or the quality of dividend income, a strategy that focuses on stable or increasing dividends can provide better outcomes in rising-rate environments. This methodology has contributed to PDC winning the 2017 Thomson Reuters Lipper Award for three-year performance in the Canadian Dividend & Income Equity ETF category. 1 While the ETF and PowerShares® Fund seek to replicate the performance of the same index or to follow the same strategy, the ETF and the fund have different management fees and expenses, and the performance of the ETF and the fund will differ. The S&P/TSX Composite Index is the benchmark Canadian index, representing roughly 70% of the total market capitalization of the Toronto Stock Exchange (TSX). The S&P 500 is an American stock index based on the market capitalizations of 500 large companies having common stock listed on the New York Stock Exchange (NYSE) or NASDAQ. PowerShares Canadian Dividend Index ETF (PDC) was awarded the 2017 Lipper Fund Award in the Canadian Dividend & Income category for the 3-year period (out of 11 funds) ending July 31, 2017. Performance for PDC for the period ended October 31, 2017 is as follows: 13.68% (1 year), 7.25% (3 years), 11.21% (5 years) and 9.74% (since inception, June 8, 2011). The corresponding Lipper Leader ratings of the Fund for the same period are as follows: N/A (1 year), 4(3 years), 5 (5 years), N/A (10 years). The Thomson Reuters Lipper Fund Awards, granted annually, highlight funds that have excelled in delivering consistently strong risk-adjusted performance relative to their peers. The Lipper Fund Awards are based on the Lipper Ratings for Consistent Return, which is a risk-adjusted performance measure calculated over 36, 60 and 120 month periods. The highest 20% of funds in each category are named Lipper Leaders for Consistent Return and receive a score of 5, the next 20% receive a score of 4, the middle 20% are scored 3, the next 20% are scored 2 and the lowest 20% are scored 1. The highest Lipper Leader for Consistent Return in each category wins the Lipper Fund Award. Lipper Leader ratings change monthly. For more information, see www.lipperfundawards.com. Although Thomson Reuters Lipper makes reasonable efforts to ensure the accuracy and reliability of the data contained herein, the accuracy is not guaranteed by Thomson Reuters Lipper. Commissions, management fees and expenses may all be associated with investments in exchange-traded funds (ETFs). Unless otherwise indicated, rates of return for periods greater than one year are historical annual compound total returns, including changes in unit value and reinvestment of all distributions, and do not take into account any brokerage commissions or income taxes payable by any unitholder that would have reduced returns. ETFs are not guaranteed, their values change frequently and past performance may not be repeated. Please read the prospectus before investing. Copies are available from Invesco Canada Ltd. at powershares.ca. There are risks involved with investing in ETFs. Please read the prospectus for a complete description of risks relevant to the ETF. Ordinary brokerage commissions apply to purchases and sales of ETF units. NASDAQ®, OMX®, NASDAQ OMX® and QQQ are trade/service marks of The NASDAQ OMX Group, Inc. (which with its affiliates is referred to as the "Corporations") and are used under license to PowerShares Capital Management LLC and Invesco Canada Ltd. The Product(s) have not been passed on by the Corporations as to their legality or suitability. The Product(s) are not issued, endorsed, sold, or promoted by the Corporations. THE CORPORATIONS MAKE NO WARRANTIES AND BEAR NO LIABILITY WITH RESPECT TO THE PRODUCT(S).